Food on Friday is going Gluten Free this time. I know this is an increasingly popular option for some people and a necessity for others. To add your recipe to the collection just put your name and the name of your dish into the first Mr Linky box and paste the url for your post into the second box. I will be pinning the recipes to this Pinboard as they come in – well, as fast as I can, anyway. PS There won't be a Food on Friday next week – Food on Friday is having the week off! Thank you, Carole! I'm not totally GF, but I feel better when I am. What a great round up. A few of my friends have given up gluten in the new year so I'm always interested in new recipes. 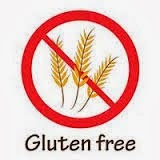 We just started eating gluten free for hubby's sake. We really enjoyed these sesame turkey meatballs. My flourless chocolate souffle cake is a favorite of my niece who has to eat gluten free. The Irish Cream Whipped Cream and Caramel Drizzle means nobody will care it's gluten-free. It is very chocolatey with a melt in your mouth texture! YUM! What a great way to start off the new year! I'm sharing some of my favorites with you--a couple of soups (Thai Creamy Chicken Noodle is both dairy and gluten free, and the Celery Rice soup I've made vegan as well as with chicken stock and added chicken), a 'fast from the farm share' curry, and my beloved beet greens breakfast skillet. We have been trying to remove gluten from our diets. It's not easy or cheap, but it does make us feel better. Thanks! So hard to choose! I realized I have almost 50 posts under gluten-free. I shared my black bean brown recipe. They are super delicious and my family never knew the difference! Amazing! I'm not GF, but my Chocolate Olive Oil Cake is, GF or not, everyone deserves chocolate cake. Thanks for hosting Carole, great theme! I have an aunt who is coeliac so I post quite a few gluten free recipes. I've put up a lovely cake but I also have gf choc brownies & shortbread recipes on Eating Adelaide. Great theme! Thanks for hosting, Carole! I linked up a few of our favorite recipes. We're a family of 13 and our house is gluten-free :)! All of my recipes on my blog are gluten-free. Great idea Carol! My site isn't totally gluten free, but the gluten free posts are the most popular. Thanks so much for hosting! I shared my Vegan, Gluten Free French Crepes, and also my Month of Gluten Free, Vegan Menus post. I'm not gluten free but none the less, I make a batch of the Black Bean Brownies nearly every fortnight. They are incredibly low in fat and freeze well so are great for lunch boxes. Glad I could once again join in the fun for 2014. Thanks for hosting Carole. Thanks so much! I added my Paleo Pancakes! Thanks for inviting me to the party Carole! I shared my snowball cookies and grain free biscuit for one. It's been so cold here in NY so soup really hits the spot. I have a gluten and nut allergy, so I make all my own soups from scratch! This is a great idea, thanks so much. I forgot to add the name of my dish, but it's a nice coffee and walnut cake, perfect for a birthday, or with a cup of tea. I'm not gluten-free, but I cook for a number of people who are! I've put up three recipes again - a raw pasta, a sponge cake that uses cornflour instead of wheat flour, and a pizza that uses giant mushrooms as a base. Hi Carole! Just added in a few of my GF recipes. Thanks for hosting! Happy New Year!!! Linked up my Red Chile Chicken Tamales. Thanks for hosting!!!! Hi Carole! So glad I have something to contribute this week. Will miss you next Friday but I hope you are missing for all good things! Happy New Year! Thanks so much for hosting. I love gluten free recipes. This Cauliflower Crust Pizza has been all over Pinterest. If you haven't tried it, it's a recipe I highly recommend. I could have eaten the unbaked cauliflower crust mixture all by itself as a meal, it was so delicious! Oh my gosh, it definitely took me a while to decide which of my favorites to link up, but I ended up going with a recent post, my Detox Quinoa Salad...it's been a great hit for the new year! Thanks so much for hosting, Carole! Hope you have a fantastic weekend! Better late than never! Happy 2014!